Satellites in orbit around Earth are used in many areas and disciplines, including space science, Earth observation, meteorology, climate research, telecommunication, navigation and human space exploration. They offer a unique resource for collecting scientific data, commercial opportunities and various essential applications and services, which lead to unrivalled possibilities for research and exploitation. However, in the past decades, with increasing space activities, a new and unexpected hazard has started to emerge: space debris. In almost 60 years of space activities, more than 5250 launches have resulted in some 42 000 tracked objects in orbit, of which about 23 000 remain in space and are regularly tracked by the US Space Surveillance Network and maintained in their catalogue, which covers objects larger than about 5–10 cm in low-Earth orbit (LEO) and 30 cm to 1 m at geostationary (GEO) altitudes. Only a small fraction – about 1200 – are intact, operational satellites today. This large amount of space hardware has a total mass of more than 7500 tonnes. About 24% of the catalogued objects are satellites (less than a third of which are operational), and about 18% are spent upper stages and mission-­related objects such as launch adapters and lens covers. More than 290 in-­orbit fragmentation events have been recorded since 1961. Only a few were collisions (fewer than 10 accidental and intentional events); the majority of the events were explosions of spacecraft and upper stages. These fragmentation events are assumed to have generated a population of objects larger than 1 cm numbering on the order of 750 000. The sporadic flux from naturally occurring meteoroids may only prevail over that from human-­made debris objects near sizes of 0.1–1 mm. The main cause of in­orbit explosions is related to residual fuel that remains in tanks or fuel lines, or other remaining energy sources, that remain on board once a rocket stage or satellite has been discarded in Earth orbit. Over time, the harsh space environment can reduce the mechanical integrity of external and internal parts, leading to leaks and/or mixing of fuel components, which could trigger self-­ignition. The resulting explosion can destroy the object and spread its mass across numerous fragments with a wide spectrum of masses and imparted velocities. Besides such accidental break­-ups, satellite interceptions by surface-­launched missiles have been a major contributor in the recent past. The Chinese FengYun-1C engagement in January 2007 alone increased the trackable space object population by 25%. The most important non-­fragmentation debris source have been more than 2440 solid rocket-motor firings, which have released aluminium oxide (Al2O3) in the form of micrometre-­sized dust and mm­- to cm-­sized slag particles. A second important source was the ejection of reactor cores from Buk reactors after the end of operation of Russian radar ocean reconnaissance satellites in the 1980s. In 16 such ejection events, numerous droplets of reactor coolant liquid (a low-­melting sodium potassium alloy) were released into space. Another historic source was the release of thin copper wires as part of a radio communication experiment during the Midas missions in the 1960s. Finally, under the influence of extreme ultraviolet radiation, impinging atomic oxygen and impacting micro particles erode the surfaces of space objects. This leads to mass loss of surface coatings and to the detachment of paint flakes with sizes from micrometre to mm. Observations with ESA’s 1 m-diameter telescope at Teide Observatory, Tenerife, Spain, have found a population of objects with extremely high area-­to-­mass ratios. The origin and nature of these objects is not yet fully understood. It is generally agreed now that these objects have been created in the GEO region, possibly from thermal covering material of disposed satellites. The first­-ever accidental in­-orbit collision between two satellites occurred at 16:56 UTC, 10 February 2009, at 776 km altitude above Siberia. A privately owned American communication satellite, Iridium-33, and a Russian military satellite, Kosmos­2251, collided at 11.7 km/s. Both were destroyed, and more than 2300 trackable fragments were generated, some of which have since reentered (that is, decayed and reentered the atmosphere, where they have burned up). Satellites launched into LEO are continuously exposed to aerodynamic forces from the tenuous upper reaches of Earth’s atmosphere. Depending on the altitude, after a few weeks, years or even centuries, this resistance decelerates the satellite sufficiently so that it reenters the atmosphere. At higher altitudes, above 800 km, air drag becomes less effective and objects will generally remain in orbit for many decades. At any given altitude, the generation of debris through normal launch operations, break­ups and other release events is counteracted by natural cleansing mechanisms, such as air drag and luni­solar gravitational attraction. The result of these balancing effects is an altitude­and­latitude­dependent concentration (spatial density) of space debris objects. Maximum debris concentrations can be noted at altitudes of 800-1000 km, and near 1400 km. Spatial densities in GEO and near the orbits of navigation satellite constellations are smaller by two to three orders of magnitude. 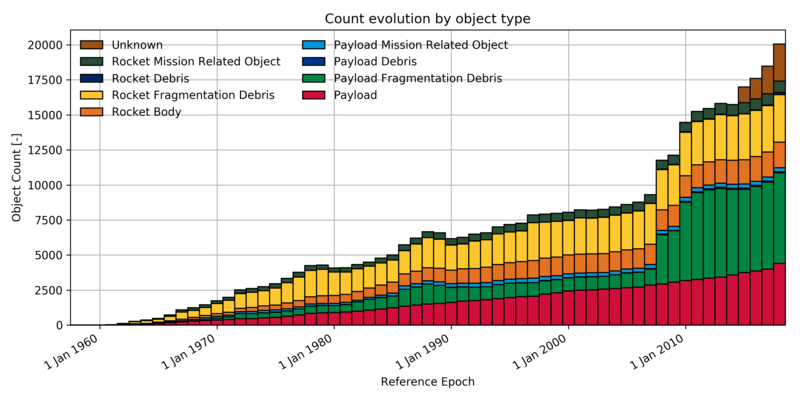 With today’s annual launch rates of nearly 100, and with future break-­ups continuing to occur at average historic rates of four to five per year, the number of debris objects in space will steadily increase. As a consequence of the rising debris object count, the probability for catastrophic collisions will also grow progressively; doubling the number of objects will increase the collision risk by approximately four times. As the debris population grows, more collisions will occur. In a ‘business-­as-­usual’ scenario, such collisions will start prevailing over the now­-dominating explosions within a few decades from now. Ultimately, collision fragments will collide with collision fragments, until the entire population is reduced to subcritical sizes. This self­-sustained process, which is particularly critical for the LEO region, is known as the ‘Kessler syndrome’. It must be avoided by the timely application of mitigation and remediation measures on an international scale.